In a timber frame house, a standard shower enclosure can never be built to last. The vast majority of new-build homes are being built with a timber frame, and with good reason. 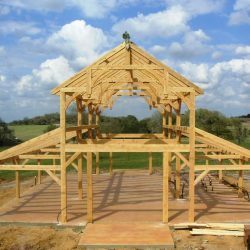 There are many benefits to timber frame buildings. They’re quick and relatively inexpensive to build. And as well as being cost-effective, timber frame buildings are also highly versatile, as they can be clad in almost any building material. But the major appeal of timber frame buildings is that they have the potential to be much greener than other building types. Building a timber frame house will result in far lower CO2 emissions than a traditional brick build. And if the wood is ethically sourced, with all trees replanted, the environmental credentials are even more impressive. It’s no wonder, then, that more than 70% of the world’s population live in timber frame homes. But if you live in a timber frame home – or if you’re a house builder who specialises in timber frame construction – then you might be sitting on a ticking time bomb without even realising it. The problem is lurking in the corner of your shiny new bathroom. A traditional shower enclosure makes extensive use of tiles, which are held in place by grouting, and sealed with silicone gel. As we’ve already pointed out, this grouting and silicone can be a problem in itself, as both substances act as a breeding ground for unhealthy and unsightly mould. But in a timber frame house, the problem has the potential to be much more serious. For all its benefits as a building material, timber does tend to shift and warp over time. Homeowners are unlikely to notice this warping. But the problem is that the bathroom will warp along with the house, and shower enclosures are not designed to warp. What do you think will happen to those solid tiles and rigid grouting as the bathroom subtly shifts around it? Cracked tiles and grouting in the bathroom are unsightly and even more susceptible to mould than usual. But worse than that, when surrounded by damaged tiles and grouting, shower enclosures are no longer watertight. They’ll be a lot more prone to leaking. And should any water ever find its way into your home’s timber frame – which it most probably will – then you’re looking at the sort of rot that can jeopardise your home’s structural integrity. So it’s really no exaggeration to say that a traditional shower enclosure in a timber frame home is an expensive accident waiting to happen. You could endeavour to redo the tiling in your bathroom every few years. But this would be costly, time-consuming, and so immeasurably tedious that you’re probably getting tired just thinking about it. But don’t worry – whether you’re a housebuilder, a homeowner, a housing developer or a landlord, there’s something very simple you can do to stop this from ever becoming an issue in the first place. Just replace your standard shower enclosure with a stylish shower cubicle. Shower cubicles don’t require any tiles, grouting, or silicone. As we’ve already pointed out, that means that they can help eliminate mould in the bathroom. But for timber frame houses, shower cubicles might actually be essential. Because there’s no tiles or grouting, there’s no danger of cracks forming when the house warps over time. This means no leaks, so no risk of rotting, so no danger to the home’s structural integrity. So to guarantee that all of their homes can enjoy a long and happy future, timber frame housebuilders should always choose shower cubicles for the bathroom. But what if you already live in a timber frame home? Is your bathroom a write-off? Are you going to have to commit to retiling and re-grouting it every few years? Not at all. Shower cubicles can be installed as a replacement to your existing shower – or even your existing bath – in less than a day. There’s no mess, and no need to worry about your bathroom being off-limited for weeks. You could have a clean, stylish, future-proof bathroom by this time next week. And if you’re a landlord or part of a housing association, and you’re managing multiple timber frame homes, you can even choose a cost-effective contract option to future-proof your entire portfolio. Shower cubicles and timber frame homes were made for each other. No matter what your relationship is with timber frame houses – whether you build them, manage them, or live in one – in the long-term shower cubicles will save you many headaches and a lot of money. So if you’ve got a timber frame in need of a shower cubicle, get in touch for a free quote.